SPOILER WARNING. If you have not watched The Hobbit: The Battle Of The Five Armies, please proceed with caution as this entry contains spoilers, or do not proceed to read at all until you’ve watched it. Again, the spoiler warning applies. I do not want to be responsible anyone getting spoiled. If you have no watched the film, the next line is the start of Too Much Information for you. The last two sound bites I have (for now) come from Richard Armitage, who managed – with his wonderful demeanor and professionalism – to make a fan out of All Film’s interviewer, Lauren. (And, really, none of the actors have his eloquence and diction. He’s orally, vocally perfect. I love transcribing him.) Listen for yourself. This sound bite was chosen purely for my own pleasure: to hear him sound exasperatedly amused at the question “Did you ever get fed up with it, playing the same character in the same universe?” Was he ever going to say yes? I doubt it. But I was amused by the tone of his voice when he answered it. They are available on Soundcloud. Please visit/listen/like/add to playlist. That would be lovely – thank you! Transcripts to Richard Armitage’s interview will be posted in this blog next week. This is not ‘the last goodbye’ to these sound bites. Now that I have a Soundcloud account, might as well upload others in the future. The only thing I need to find time for is to edit them… but I hope these sound bites have been enjoyable and illuminating and able to provide some excitement at this final chapter of Peter Jackson’s Middle-earth saga. When All Film met up with Orlando Bloom and the other cast members of The Hobbit: The Battle Of The Five Armies in London a few months ago, we couldn’t help but sneak in one important question to the actor we’ve affectionately referred to as ‘Orly’: tell us more about the Elves and Dwarves. The question is not without basis. We are quite delighted when we saw that scene The Hobbit: The Desolation Of Smaug where Bloom’s Legolas called his future companion Gimli “a goblin mutant” to Gimli’s father’s face. Not only was it an amusing homage to their amazing friendship in Lord Of The Rings trilogy, but it was also apparently a setup for another blossoming Elf-Dwarf friendship between Legolas’ friend Tauriel (Evangeline Lilly) and the dwarf Kili (Aidan Turner). We wouldn’t go so far as to call it a love triangle but we know there are a few out there who call it exactly that. So rather than speculate, why not ask Bloom directly what he thought about the relationship? And the actor responded spectacularly. 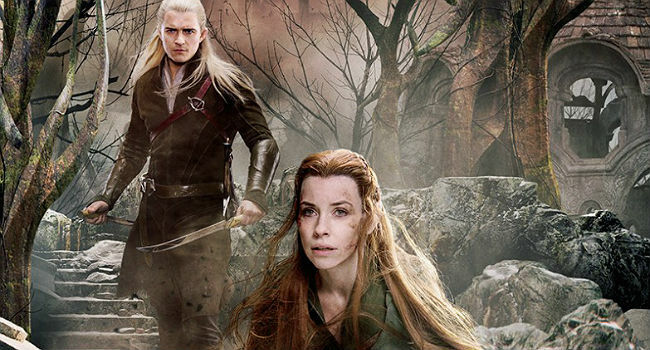 Fair enough, but Bloom also explained that Tauriel was Legolas’ kin and so he was protective of her. “You can probably read all sorts of things into all of that,” he acquiesced. While Bloom didn’t report any sort of off screen shenanigans between Elf actors and Dwarf actors on the set of The Hobbit, we’re pretty sure there was still a bit of mischief that happened during the course of filming. Of course we’d prefer it if all the bitter rivalries and fighting between these two races happened solely on screen on Peter Jackson’s last The Hobbit film. This interview can be read in full in All Film #60. For more info, read here.